Certainly, Filipinos are always goodhearted in nature. We’ve seen a lot of times where people from all walks of life return lost items to their respective owners, may it be drivers, airplane crew or even just a random stranger seeing a lost wallet when that person went to that location, we can see that our honesty has been shown all throughout and we are always touched by these stories. And yet we see another Good Samaritan trying to help someone that has lost an item. 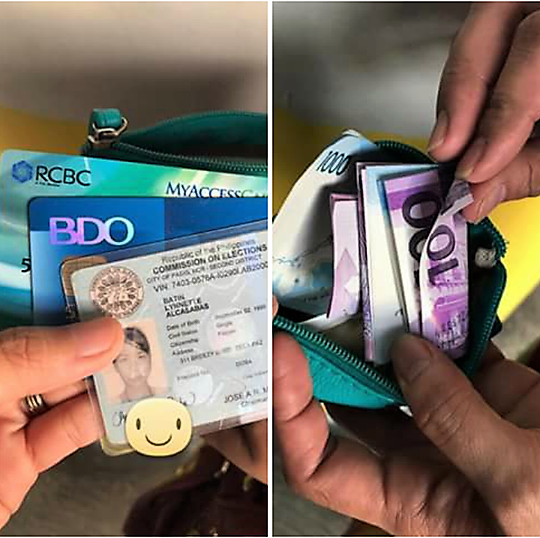 Today, we feature a netizen named Honey Yap she tapped the powers of social media to find a way to give back a lost wallet. The wallet contained four thousand pesos, an ATM and credit card and finally a Voter’s ID. According to the image we see, it was found at an FX en route to Megamall. For now, there have been no updates whether she already found the owner of the lost wallet but I believe we can help her out and return the lost wallet to its owner. By reading this you will be aware of this post, if you know someone named Batin, Lynnette Alcalabas you can her regarding about her lost wallet and finally reunite it to the owner. If you don’t know though, you can just share this so by the power of sharing she might find this and recover her wallet. Let’s join this woman’s endeavor to be a great Filipino. Together, let’s restore the faith in humanity!